From general settings you can set theme color, theme fonts, background images and blog layout.You can also remove background opacity. 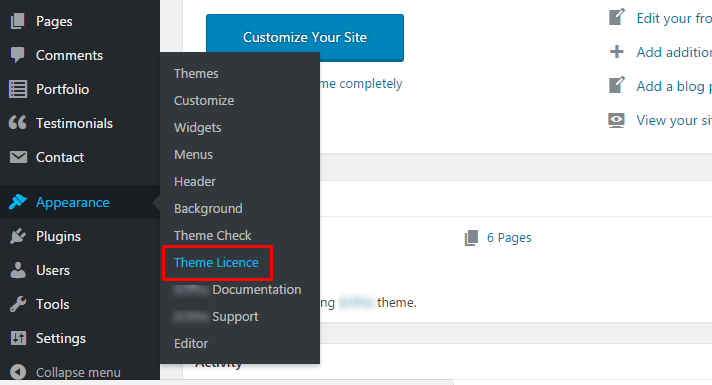 From this option you can set your theme in different colors. From this option you can different background images.You can also upload images from your computer. From this option you select different theme fonts. From this option you can set your blog page in 3 different layouts.Right sidebar, left sidebar and without sidebar. From this option you can remove background opacity. From this option you can set welcome title, welcome image and welcome text. 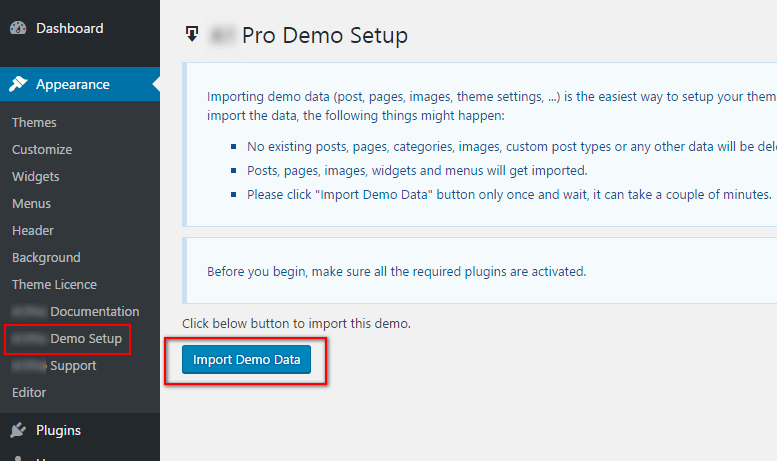 From this option you can set welcome title for home page. From this option you can set welcome image. From this option you can set welcome text. After making all the changes from backend changes will appear in frontend. From here you can do head settings of your website. You can set website logo and Favicon. From here you can set your website logo. Once you will set it then it will appear in frontend of your website. From here you can set favicon of your website. Once you will set it then it will appear in frontend of your website. After uploading logo and Favicon you can see changes in frontend. From here you can make footer changes to your website like changing copyright text, adding analytic code.You can also remove copyright text if you don’t want to show it in bottom. This option allows you to change the copyright text of your website. If you don’t want copyright text appearing in bottom of page you can select checkbox. By default if comes with copyright text. You can enter Google analytic or any other tracking code. You can use Google analytic code for SEO purpose. After making all the changes in backend it will appear in frontend. In this part you can add links of your social media profiles like Facebook, Twitter, Google+ and LikedIn. From here you can set Facebook account link. From here you can set Twitter account link. From here you can set Google+ account link. From here you can set LinkedIn account link. After setting all the links in backend you can see it frontend.Once you click on it it will open social media pages. From here you can do settings for contact us page. From this option you can set title for contact us page. From this option you can set caption for contact us page. From this option you can set address for contact us page. From this option you can set fax for contact us page. From this option you can set phone for contact us page. From this option you can set email for contact us page. After setting all the details in backend changes will appear in frontend. Besty Pro theme comes with contact form 7.After creating a contact form you can use short codes for displaying form into post or page. 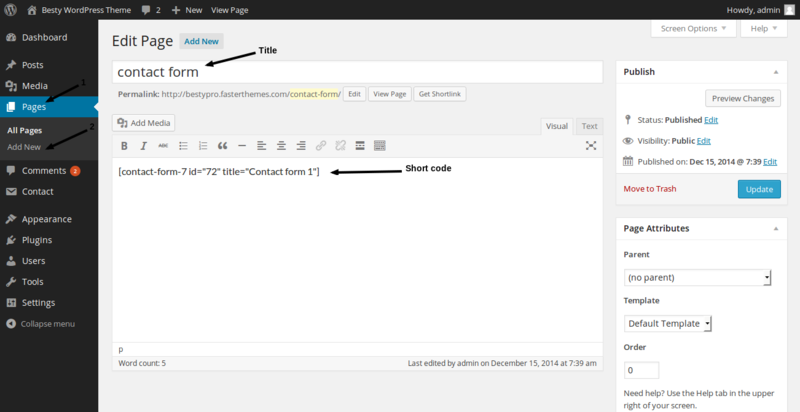 After creating a contact form you can use shortcode in post or page. Below you can see how to use short code in new page. After making changes in backend contact form will be visible in frontend.